The north Pacific tropical cyclone season has now begun, with typhoon Nepartak heading on a route which looks set to impact Taiwan and the southern Japanese Ryuku islands currently, with forecasts suggesting a strong landfall in Taiwan as most likely. Read our latest update on now super typhoon Nepartak here. Typhoon Nepartak formed in the north-western Pacific at the weekend, ending a record 199 day stretch without tropical cyclone development in this region of the world. Since forming, Nepartak has strengthened into a category 2 typhoon, with some steady intensification expected. Currently Nepartak packs sustained winds of around 85 knots (98 mph) and gusts of up to 105 knots (120 mph), however that is expected to increase dramatically with the majority of forecasters expecting typhoon Nepartak to strengthen into an intense category 4 cyclone. The latest forecast from the Joint Typhoon Warning Center (JTWC) shows typhoon Nepartak making a beeline for Taiwan with winds expected to approach 125 knots (144 mph) and gusts of up to 150 knots (170 mph) by the time it nears the island. That forecast is particularly extreme, others suggest winds and maximum gusts in a range of 100 to 140 knots (115 mph to 160 mph) which is still intense and if typhoon Nepartak makes a direct landfall hit could result in severe and damaging impacts. A storm of that intensity will concern the insurance and reinsurance industry, as well as some insurance-linked securities (ILS) fund managers and collateralised reinsurance vehicles, as if Nepartak does make a landfall damage could be widespread. Nepartak could also near Shanghai, bringing torrential rain to one of the most insured regions of the country. Whether a storm surge is a threat to the Chinese mainland is at this stage uncertain, as depending on the route Nepartak takes it could be much weakened after crossing over Taiwan. The JTWC forecasts a hit on the north-eastern corner of Taiwan, however forecasts from the Japanese Meteorological Agency and also the UK’s Met Office both opt for a more westerly hit. Some uncertainty remains, due to the expectation that typhoon Nepartak will recurve, which if it happens earlier could mean the storm misses Taiwan and strikes the Japanese Ryukyu islands. This should become clearer over the next few days, with Nepartak expected to near Taiwan on Thursday. Whatever the final direction, typhoon Nepartak is expected to bring torrential rain to the region, including to an already sodden Chinese mainland. With forecasters suggesting as much as 200mm to 300mm of rain will fall in some areas there is the chance for severe flooding and landslides to occur. Even southwest Japan itself may feel some of the rainfall effects, as typhoon Nepartak curves north. 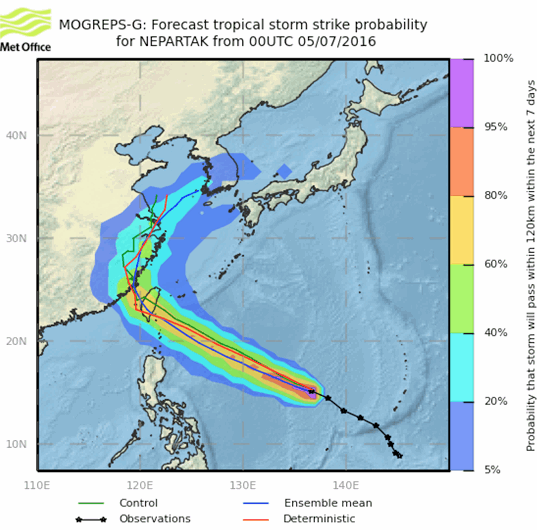 Insurance, reinsurance and ILS interests should watch typhoon Nepartak closely, as the forecasts have been upgraded in intensity recently as forecasters become more certain of the storms potential to cause damage. As the track becomes more certain over the next 24 hours it should become clearer just how much Taiwan is in the bull’s eye. ILS and collateralised reinsurance interests have been shown to be exposed to Taiwan typhoon risks before, due to the proliferation of private ILS and reinsurance deals. However the traditional reinsurers will hold most of the exposure in this region of the world. We’ll update you if this threat to Taiwan becomes clearer and more manifest. You can view a near real-time visualisation of typhoon Nepartak on approach to Taiwan below.